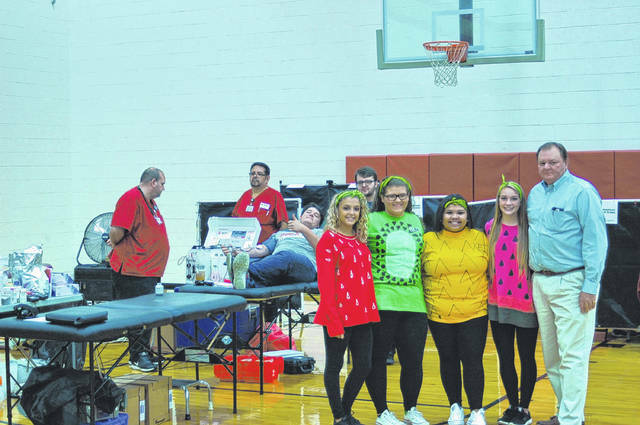 Members of the South Gallia LEO club dressed up as fruit for the Halloween aspect of the blood drive Wednesday. MERCERVILLE — South Gallia LEO Club held its first blood drive of the year Wednesday. LEO Club is a student organization intended to do charitable work and build character in students. Part of that charity is hosting and organizing blood drives twice a year; in the fall and spring. “The South Gallia Community always tries to help out our fellow communities by giving back,” said Jeff Fowler, advisor to the LEO Club. While giving blood is, in itself a charitable act, Red Cross donates to a scholarship fund at SGHS according to how many quarts are donated. The group set the goal of 22 units donated for this event and 50 for the year. If they hit their goal for the year, Red Cross donates a $250 scholarship that the LEO Club then disperses. They were able to collect 29 units of blood Wednesday, surpassing their goal for the day. “The kids did a really good job this year, lots of blood donated,” said Fowler. LEO members also earned community services hours for working the event, helping sign in givers and assisting them after donating. As a part of the event, LEO members dressed up in costumes for Halloween. Several members collaborated, coming together as different fruit. “We want to give a special thanks to Red Cross and the staff at South Gallia for making this possible and helping out,” said Fowler. The organization has been there for over two years now, with a total of 25 members on the roster. Last year they tackled projects such as blood drives, wrapping Christmas presents with the Lion’s Club, the special Olympics, and raising money for a new sign and outdoor furniture at the school.